There’s simply no lighter high-performance laptop on the market than the LG Gram 15. This super lightweight lapper (only 2.2 lbs.) 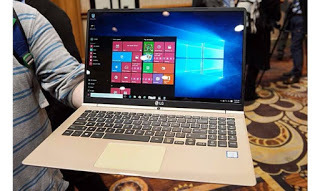 comes with Windows 10 OS installed, a powerful 6th generation Intel Core processor, full HD picture quality and many connective options including a built-in HDMI port for easy connectivity straight into a TV. No college student would ever complain about having to carry around this computer, which is lighter than most tablets and feels as light as a pile of a dozen sheets of paper. The Intel Core i5 version ($1,099) comes with 8GB of memory and 256GB of storage, while the i7 ($1,199) has 512GB of storage.